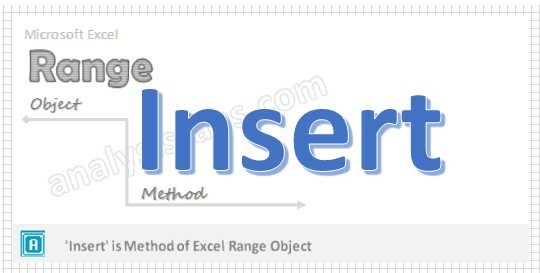 We can use VBA to Insert a cell or range(Collection of cells) in a worksheet, While inserting a range it will shifts the other cells towards Right(xlToRight) or Down(xlDown) side. VBA Insert range will be helpful while automating a task and you want to provide some more cells in between the another range. You can also insert entire Row(s) or Column(s) in that particular range. Here is the syntax to Insert a cell or range(Collection of cells) in a worksheet and then it will shifts the other cells towards Right(xlToRight) or Down(xlDown). Shift – (Optional): It will specify the cells to which side has to shift. Following are the two constants xlToRight and xlDownto shift the cells to either right or down side. CopyOrigin – (Optional): we can use the CopyOrigin to mention destination location of the range. Below is the Excel VBA Macro or code to Insert range.Here inserting the range in “C7” and moving the cells towards down position. Below is the Excel VBA Macro or code to Insert range.Here inserting the range in “C7” and moving the cells towards right side position. Below is the Excel VBA Macro or code to Insert entire rows in the range.Here we are inserting rows in the range(“B2:D10”).ie. This will insert the new rows 2 to 10. Here CopyOrigin tells excel weather if you want to insert the new rows with the above or below row formats. ‘xlFormatFromLeftOrAbove’ will copy the above rows formats while inserting new rows. xlFormatFromRightOrBelow will copy the formats from the below rows while inserting new rows. Below is the Excel VBA Macro or code to Insert entire columns in the range.Here we are inserting columns in the range(“B2:D10”).ie. This will insert the new columns ‘B’ to ‘D’. Here CopyOrigin tells excel weather if you want to insert the new columns with the left or right column formats. ‘xlFormatFromLeftOrAbove’ will copy the left side column formats while inserting new columns. xlFormatFromRightOrBelow will copy the formats from the right side column while inserting new columns. Enter some data in any cells in range “C5:E6″ to test this macro. How can I insert a range of 6 rows (or 6 rows) before every 28th row, i. e. 34., 62., 90., and so on?